While Northern Virginia awaits the arrival of thousands of Amazon HQ2 jobs, Amazon continues to expand in Maryland, officially opening its newest distribution center in Baltimore County. Maryland Gov. 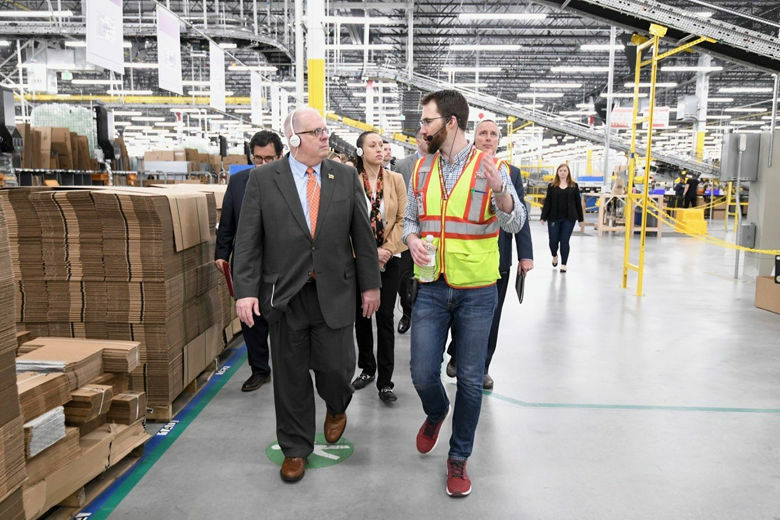 Larry Hogan was on hand for the ribbon cutting and tour, and told reporters he’s not giving up on more jobs from Amazon. Hogan commented that he met with Amazon leaders about a week ago to let them know Maryland is still interested in being a possible alternative to New York City for half of Amazon’s HQ2, The Washington Post reports. Amazon pulled out of plans for Long Island City earlier this year, and said at the time it did not plan to reopen its site search. The new Amazon Fulfillment Center, at Tradepoint Atlantic in Sparrows Point, employs more than 2,000 people who sort, pack and ship Amazon orders. “This is a great day. Not just for Amazon and Tradepoint Atlantic, but for Baltimore County, for the Port of Baltimore, for Maryland, and for the entire region,” said Maryland Commerce Secretary Kelly Schulz. The new, 850,000-square-foot Sparrows Point facility is Amazon’s third fulfillment center in Maryland. Amazon now has more than 5,500 employees in Maryland.